Mechanical Engineering Professor Miao Yu has been named an American Society of Mechanical Engineers (ASME) Fellow. Yu was recently named the Director of the Maryland Robotics Center, and is an affiliate faculty member of the Institute for Systems Research (ISR). 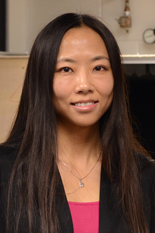 Yu received her Ph.D. from UMD in 2002, and joined the department as a faculty member in 2005. During her time at Maryland, she established and now directs the Sensors and Actuators Laboratory where her research focuses on optical sensors, sensor mechanics and material behavior at special scales and micro/nano sensor systems. She has been published in leading journals, including Nature Communications and Scientific Reports, as well as Applied Physics Letters and Optics Letters. Yu currently has six U.S. patents, five of which have been licensed by industry. She has received numerous awards and recognitions throughout her career. She won UMD’s Invention of the Year Award in the Physicals Sciences Category in 2002. In 2007, she was awarded the National Science Foundation’s (NSF) Faculty Early Career Development (CAREER) Award and the Air Force Office of Scientific Research’s Young Investigator Research Program (YIP) Award. Yu currently serves as an Associate Editor for the American Society of Mechanical Engineers (ASME) Journal of Vibration and Acoustics. The ASME Committee of Past Presidents confers Fellow grade memberships on worthy candidates to recognize their outstanding engineering achievements. Nominated by ASME Members and Fellows, an ASME Member has to have 10 or more years of active practice and at least 10 years of active corporate membership in ASME.